Every two weeks CBS News Correspondent Steve Hartman invites someone to throw a dart at a map of the United States, and wherever it lands is where he goes to get a story. Because McMullen County, Texas, is heavy on longhorns and short on human beings, this story must begin differently. Normally he flips through the phone book, but this time there was no way to flip a whopping two-pager. So he just pointed and perhaps predictably got his very first, honest-to-goodness, spur-jingling, hat-wearing Texas cowboy. 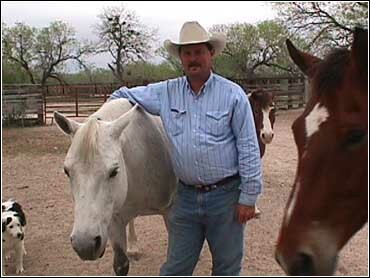 Michael Swaim breeds horses. He relies on an old kiddie-ride contraption and a donkey named Eeyore. "Everybody's got something they like to do, and that's what I like to do," Swaim says. Yet as exciting a job as it is to everyone but Eeyore, Swaim's story has little to do with his work. In fact his story began 12 years ago. He had just married to his wife Sandra, and like a lot of men who run ranches, he started dreaming about a family of boys. The idea, he says, was to have someone "follow in your footsteps, I guess. I would have liked to at least had one." Instead he got Lindy, who is the youngest, and Baily, the oldest, but it was the middle child Carly, who forever changed Swaim's perspective on what family is for. His wife Sandra recalls a key event. "It was just a horrible accident, and that was what it was." "How did something like that happen to your child on the very best horse you've raised in your life?" Swaim asks. "And it did, you know." Swaim had just finished roping some steers, when Carly asked if she could sit on the saddle. When he obliged, the horse got spooked. It took off through an open gate and ran down the driveway. There was a pickup truck parked right in the opening, and when the horse tried to jump over it, Carly slid off to the left of the horse and hit her head squarely against a four-inch pipe at the edge of the wall. "You know I didn't know if she was dead or knocked out," Swaim says. They rushed her to the hospital where she died. Three times she died, and three times the doctors restarted her heart. And that third time was a charm, thereby giving Swaim another chance to appreciate his family. "Oh, it just makes you happy for what you got, you know. I said I don't care if they ever get on a horse agin," he says. The irony is, now that he doesn't care if his kids follow in his footsteps, it seems maybe they will. "They'll go round and round all day," he says about his kids. Lindy is on the training horse, Carly is roping a plastic steer, and Baily says she wants to start barrel racing - all of which has led this cowboy to this poetic conclusion: "Once you get them little girls, you know, they're just as good as an old hairy-legged boy," he says. OK, so Will Rogers he's not.